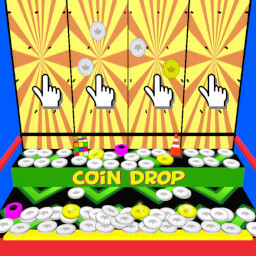 Here we have another carnival game from the arcades, this time its the penny pushing, coin shoving retro classic Coin Drop. You start with 50 coins, click a chute to drop your coin drown, watch it bounce around before joining the pile on the moving top shelf. The moving shelf will bull doze all the coins, hopefully pushing some onto the lower shelf, then over the edge and back into your piggy bank. Gold coins are worth 5 each, so its worth going for those if you can. There are also a stack of prizes to collect, again you’ll need to drop your coins in to push them over the edge and into your pocket. That’s it, simple enough – download Coin Drop now – its a pushover. Get it now on the Play store.